A Los Gatos man was arrested Tuesday in connection with the May 2008 Summit Fire that raged for seven days in the Santa Cruz Mountains, according to the Santa Clara County District Attorney's Office. Investigators from Cal Fire and the district attorney's office arrested Channing Verden, 50, said spokesman Nick Muyo. Fire records and witness interviews allege that Verden did not take appropriate safety measures while burning debris on a brush-clearing job, sparking the fast-moving, destructive fire. 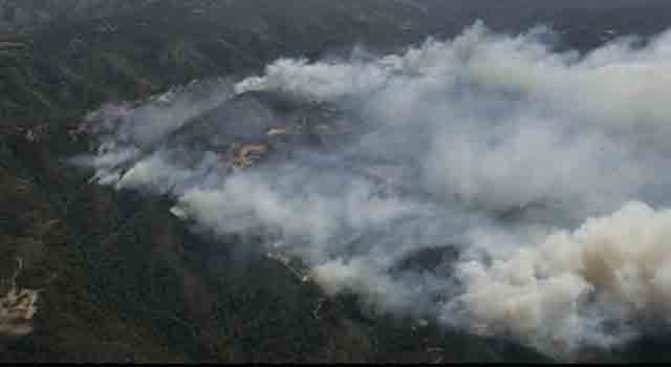 The Summit Fire destroyed 132 structures and outbuildings, and consumed 4,270 acres of brush and timber in the area. 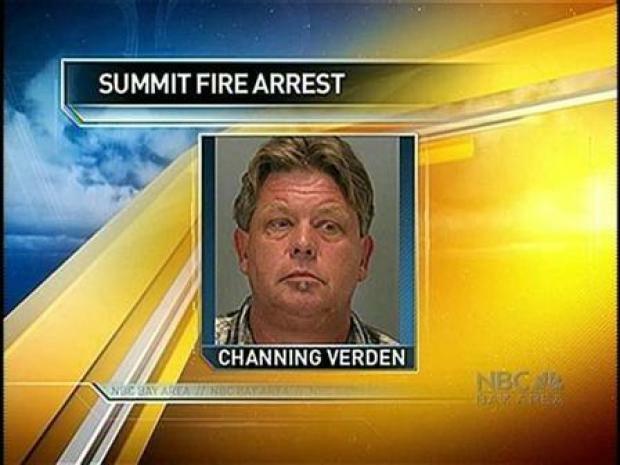 Contractor Channing Verden is charged with a felony count of unlawfully causing a fire, plus an enhancement of causing multiple structures to burn in connection with the raging fire in the Santa Cruz Mountains in 2008. Verden is being charged with a felony count of unlawfully causing a fire, with additional charges for causing multiple structures to burn. If convicted, these charges carry a maximum of seven years in prison. In her statement to the district attorney's office, Cal Fire investigator Kay Price alleged that Verden was aware hazardous fire conditions existed, yet burned several oversized debris piles at a property at 31000 Summit Road. The fire was reported in the early hours of May 22. Later that day, Cal Fire investigators found remains of six piles of tree brush in a clearing on the Summit Road property. Two of the piles were still smoking. In her statement, Price said the high temperatures in these two piles "indicated there was no effort to extinguish the piles with water prior to any work crews leaving the job site over four weeks ago." Fire investigators ultimately determined that embers blowing from a debris-burning operation caused the blaze. At the time of the fire, open burning had been suspended in the area because of dry conditions. Cheyenne Sun Hill, a man Verden hired to assist with the job, told investigators that he was present when Verden burned the overly large piles. He said Verden told him they did not have permission to burn that day, and that night he "used a shovel to extinguish several small fires on the property." Verden is scheduled to be arraigned at 2 p.m. today at the Santa Clara County Hall of Justice.